‘There are a number of contemporary artists, Maggi Hambling among them, for whom Holy Week and particularly Good Friday is a period for a specific creative endeavour. However agnostic or otherwise those artists might be, there is a sense in which this annual Christian narrative – of corruption, betrayal and pain – is played out through visual images, sometimes literal depictions of the crucifixion, often melancholic allegories of existential import. Phil Baines, […] might be counted among these practitioners but his annual exercise is one of exultation. 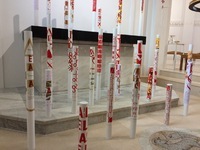 Falling as it often does between terms, each year in Holy Week Baines designs and fabricates a Paschal candle which is the focus of the beginning of the Easter liturgy, symbolising light coming out of the darkness. In most churches these are bought off-the-shelf from an ecclesiastical supplier, but former colleagues of Baines from his pre-art school days at Ushaw College (a training seminary for Catholic priests), have been the fortunate recipients of his designs over the last 32 years. 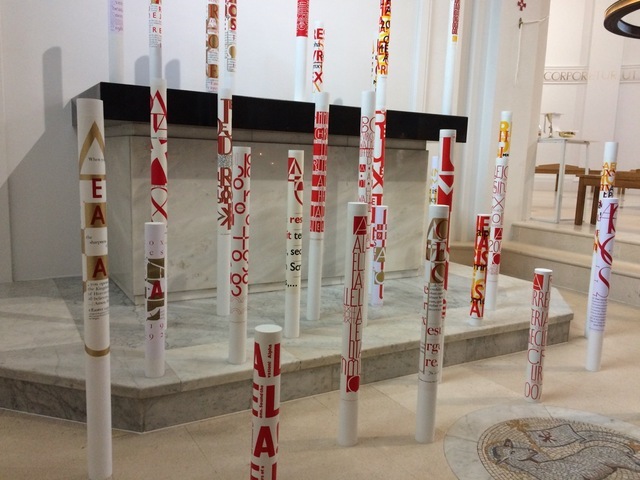 At St Augustine’s, Hammersmith, all 32 of Baines’ Paschal candles were brought back to life […]. They stood within a small side chapel in the newly reordered church with clean white walls, marble floors and a simple marble altar. 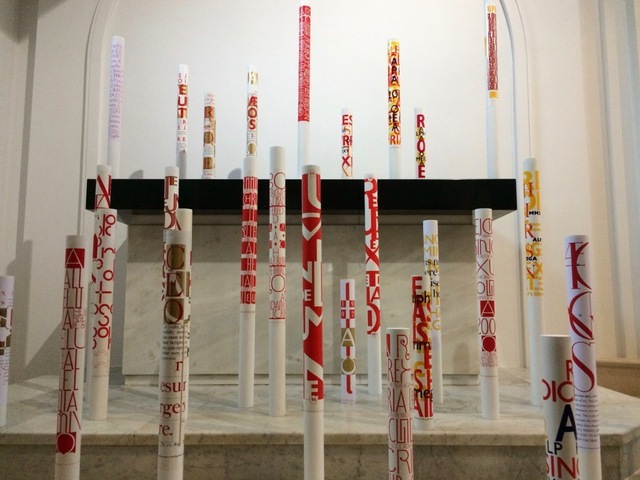 The combined effect of such typographic dexterity was almost dizzying, with words and symbols jumping out in reds and golds and, in later designs, a dark blue. 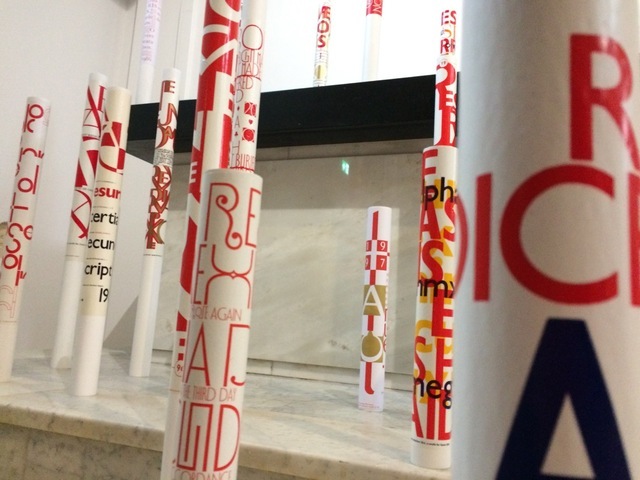 As Baines explains in the exhibition booklet, ‘the rules for a Paschal candle are few: it should have a cross, it should say A (alpha) and Ω (omega), it should state the year.’ Early designs utilise Latin text from the Exsultet (which is said or sung during the Easter Vigil when the candle is lit) with larger lettering providing dynamic intersecting lines and overlayering in cross formations. By the late 1990s the lettering is predominantly sans serif, with mutations of nesting letters and some typically clever uses of letters that act in dual roles. For example, a ‘t’ of ‘Et’ becomes a cross dividing the pictorial plane into quarters. At the millennium Baines designed his own font, Vere Dignum, specifically for the purpose of the candles and it’s deployed with beautiful, lavish effect, and in red only, in a further six silkscreen designs. Scrolling serifs and thin tall letters reminiscent of ironwork and calligraphic scripts are wonderfully redolent of ecclesiastical designs of the past that Baines is able to draw on. Finally, in the last couple of years, the designs reflect a new interest for Baines in bell ringing, and the complex patterns used in method ringing. 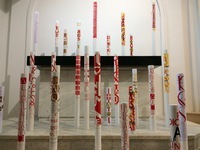 Replacing numbers with letters from the word GLORIA, the face of the candle is riddled with different permutations, and the eye just about catches the pattern beginning to take shape as the letters spiral down the cylinder form. Review by Laura Moffat, Forum (Journal of Letter Exchange) 95.